Just your average thirty-something nail polish addict sharing my addiction with the world or the 2 friends following me - thanks mom! I'm super excited for today's post, it's my first post participating in Polish Days! A while back on twitter, I was seeing all these #polishdays hashtags and countdowns to polish days and I was curious and somewhat jealous I wasn't in on the in! Doing a little research (it wasn't that hard, everyone was talking about it), I found what I was looking for. Hannah at Polly Polish has set up Polish Days, a monthly event for nail bloggers to produce a themed manicure and share it with the world! I was super excited it was so easy to sign up and couldn't wait until the next month's theme was announced. And what a theme it is, OLYMPICS! I know you can't be sick of the Olympics yet, so what if all your favorite shows aren't aired for two weeks and all you can find on tv is unending coverage of speed walking and beach volleyball - the Summer Olympics ROCK! My mani is inspired by the bathing suits Canadians, Meaghan Benfeito and Roseline Fillion, wore to win a bronze medal for Canada last Tuesday for synchronized diving (10 metre). I actually managed to catch this on tv and it was pretty amazing! I also caught a globe and mail video on them that was aired during the event, which gave a brief history of their career and friendship. These two are the absolute cutest, they are best friends and make me super proud to be Canadian! I won't post the inspiration pictures directly on my page, but if your curious, click here and here to see the suits they were wearing! How did I do? 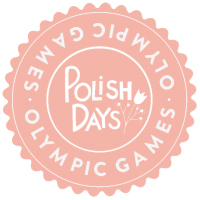 Check out the other fabulous bloggers who have participated in Polish Olympics!! I totally read this as Polish (as in "From Poland") and I was going to chastize you for not cheering on fellow Canucks. But you did them justice. YAY Nicole! Thank you so much, that is so sweet!! Swear away sister!! Okay, here's the trick, I bought some stickers from the dollar store and I used an exacto knife to cute out the flag then I put the sticker on my thumb and painted inside the stencil - if that makes sense.....I had to do some touch ups with a paint brush, but it worked better than my freehand attempt, which was crap! Your nails look awesome, and it's so cool that you got your inspiration from their swim suits. Thank you!! I wanted to do something a little different!! Loved your creativity and your patriotism! Orange you Glad I'm Posting Today?